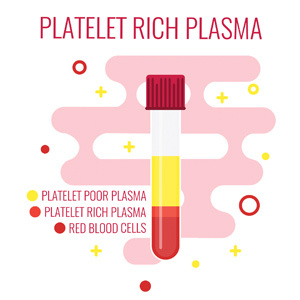 Platelet rich plasma or PRP therapy (sometimes referred to as Vampire Facelift) makes use of your body's own ability to heal and regenerate. The aim is to increase the platelet concentration and in turn increase growth factors and speed up tissue regeneration. At Sandown Skin Clinic we use Plasma Rich in Growth Factors (PRGF) the most scientifically researched PRP therapy, which is 100% safe. It stimulates production of your own collagen and elastin, strengthening and hydrating the skin and affording protection against and reversing the effects of sun damage. It can diminish lines, soften scars and reduce acne scarring and pore size. It can also be used to regenerate hair follicles in hair loss cases and reduce dark circles under the eyes, which can be difficult to treat. A small volume of your blood is taken and placed into a special machine called a centrifuge. This process separates your plasma from the rest of your blood. Concentrated in the plasma are your platelets, which are cells responsible for tissue regeneration and rejuvenation. The platelet rich plasma is then injected into the skin using a mesotherapy gun. At Sandown Skin Clinic we use the most sophisticated meso-injector on the market, widely recognised as the gold standard in aesthetic medicine. There are no foreign substances required in the treatment; it is 100% natural, which is unique in facial aesthetics. The treatment takes an hour and there is little or no discomfort involved. You can immediately resume daily activities, just no make up for 4 hours after treatment and the therapy can be combined with other treatments. For optimal results, three treatments are recommended allowing three weeks between each treatment. Then a maintenance treatment is recommended every 6 months.